High quality, 90 degree spark plug crimp terminal for use with shorter length plugs and our 7mm OD PVC ignition (HT) cable. This terminal incorporates a locking band to ensure a good contact with the plug. 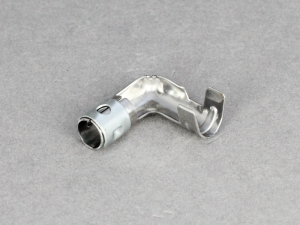 Use with our 90 degree spark plug terminal cover P00983. Nice little terminal. Fitted the end of the HT lead nicely. Good spring loaded spark plug end. Snapped onto plug nicely.